We took a late morning Trenitalia train from Rome to Venice with the kids and arrived late afternoon. As usual, we dedicated our first day in a city to arriving, getting settled, and eating. 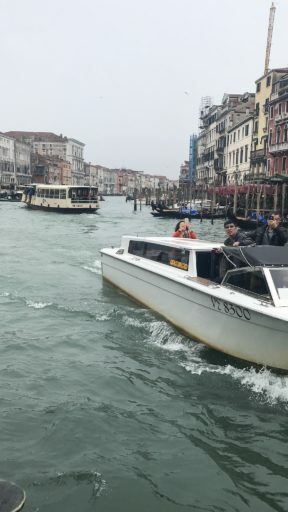 When you arrive in Venice via train, there is a vaporetto [or water bus] stop right out front of Santa Lucia. There are a few different routes but route #1 is arguably the most scenic. It takes you right up the Grand Canal to Rialto, San Marco, and a few other places. There is covered seating on a portion of the bus but the open air seating [technically, standing] is where the views are. There is a bit of boat noise that might bother small kids but it is nothing major. Plus, kids under 6 ride free [YAY!!]. If taking a private gondola ride isn’t in your budget, this is a great alternative when visiting Venice with kids. Aparthotels [or as normal people call them — managed apartments] are our favorite places to stay because they come with the perks of a hotel but the space of an apartment. We had high hopes for this place after our stay in Rome and it did not disappoint! Phil and I had our own bedroom while the girls shared the bedroom next door. However, the apartment also came with a large living room [with a seating area] with a sofa that could have easily slept 2-3 [maybe even 4] more people. It also had a full kitchen with another seating area where we could prepare breakfast and snacks. Both the bedroom and the living room have canal views too! They have [highly insulated and dang near sound proof] windowed doors that allow you to step out on a small balcony to enjoy the view. And don’t worry — the doors are very secure so no worries about mishaps with the little ones. 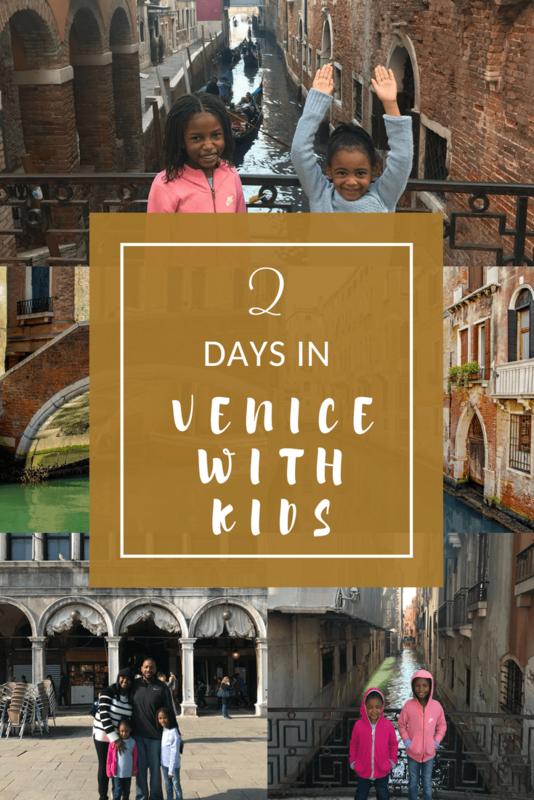 Highly recommend this place when visiting Venice with kids! 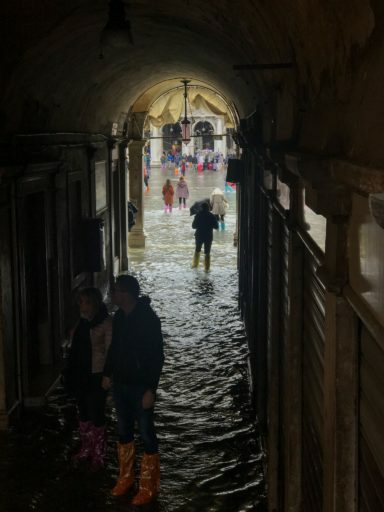 Prior to our trip, we’d read about Venice’s reputation as the “sinking city” and expected to wade through a few puddles at certain parts of the day. Silly us! 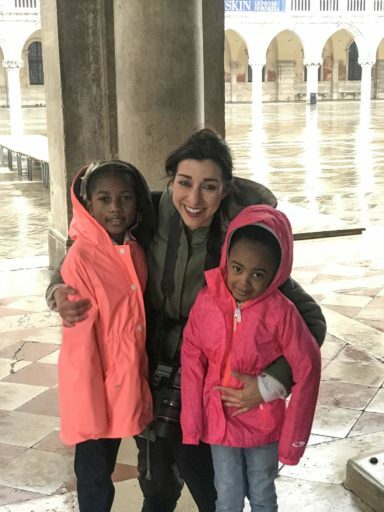 When it rains in Venice, it pours! Well, not literally but you get the idea – you get a lot more than puddles. 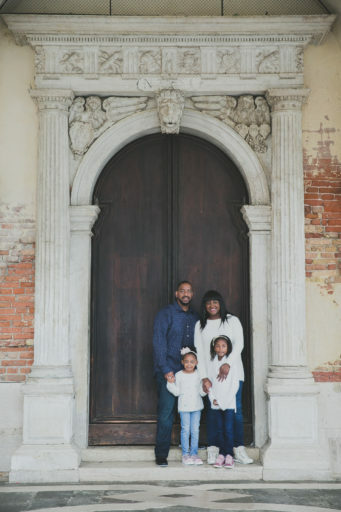 They call it acqua alta and it can get as tall as knee high — which is exactly what it did our second morning in Venice. 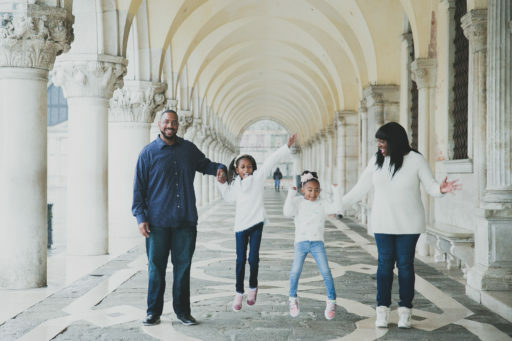 Unfortunately, we were painfully unprepared and were not equipped to wade through the waters of Venice with kids on tow. Fortunately, the water recedes with time and we were eventually able to get out and about. Don’t be like us — if you’re visiting in the winter or spring, invest in shoe covers. If you don’t purchase them in advance, don’t worry! They are sold in most of the shops in the city. The cheapest place to get them is at a grocery store. We declined to climb this massive structure but we spent an ample amount of time taking pictures of it and walking around it. It’s as gorgeous in person as it is in pictures. This seems like it should go without saying but there are a bunch of stairs at the Rialto Bridge. That means it is not very stroller or small kid friendly. In fact, the majority of the city is not very stroller friendly. We saw [and helped] many families struggling to carry their strollers [with babies still in them] up and then back down the stairs all over the city. If you’re up for it, I’d recommend baby wearing over using a stroller. 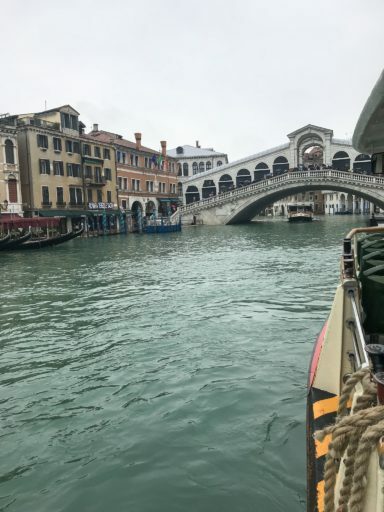 We had a very structured itinerary for our trip to Rome but all our research on Venice led us to believe that it would be best if we spent our days just exploring. It is probably the only time in my life that I actually planned to get lost. In a foreign country. With kids. But it turned out to be an awesome plan! Have you ever seen the movie Maze Runner? Venice is like the maze that the main character woke up in. Except you don’t lose your memory [just take it easy on the vino]… and there’s no secretive society [or at least not that we know of]….and you’re not in the fight of your life. Maybe that was a really bad example. Point is that Venice is made up of a never ending amount of small, winding, magical streets that lead you across the island. Or possibly to a dead end. But even that will be enjoyable! Plan to spend time exploring the city, getting a feel for the lay of the land, and eating your weight in gelato. There are also lot a shops — both large and small — all over the city and the best things can be found off the beaten path. The girls got all kinds of cool things like a glass necklace [made in Burano] with their initials on it, miniature Venetian masks, and so much more. This is a very popular area of Venice so be prepared for a little bit of a crowd. And if you happen to visit Venice in March like we did, be prepared to queue in some places. Early Spring is considered off-season so many of the advance booking options are not available. There’s plenty of eating around this area if you want to grab a bite to eat. It is one of the most expensive areas to eat in Venice though so be warned. Also, the seagulls are vicious. Luckily, we were spared The Wrath of the Seagull but others around us were not so lucky. We may or may not have seen a poor lady jump up in the sky to grab her sandwich from the mouth of a bird. She was miraculously successful but we didn’t stick around to see if she ate it [although we hope she didn’t]. Be on high alert or eat inside if possible. 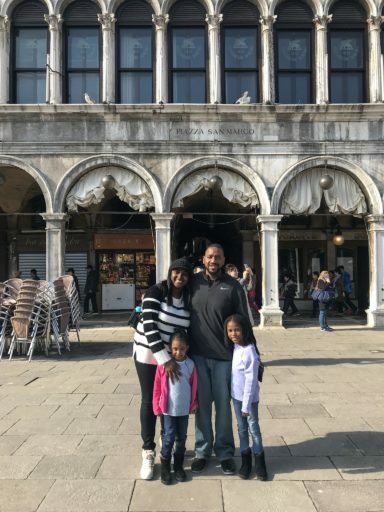 If you’re visiting between April and November, you can purchase tickets to St. Mark’s Basilica ahead of time to avoid waiting in line. Kids under 5 are free [YAY free things for kids!] with the rest of the family ranging between 9-12 Euros at the time of this post. Please bear in mind they close in recognition of events [not just holidays] so check their website before you visit! The clock tower, unfortunately, does not allow kids under 6 to enter. So if your kiddos are small like mine, this one isn’t for you. But no worries, the view from the exterior is just as impressive! If your kids make the cut, then you can purchase tickets to view the tower on their website. Price ranges from 7-12 Euro depending on age. They even offer “after hour” tours by request if you purchase 12 tickets. Doge’s Palace is the another main attraction in St. Mark’s Square in Venice. It, along with Museo Correr, Museo Archeologico Nazionale and Monumental Rooms of the Biblioteca Nazionale Marciana, make up the St. Mark’s Square Museums. You can get a single ticket to visit all 4 venues for one low price. Kids 5 and under are free [YAY!!! again] and they have a variety of ticket options available for the rest of the family. 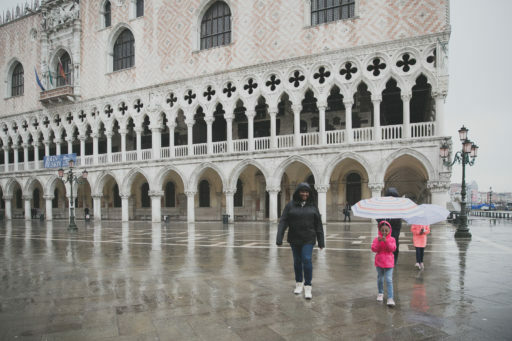 We are not generally huge fans of tours but we’ve heard rave things about the two tours offered at Doge’s Palace: the Secret Itineraries Tour and the Hidden Doge’s Treasure Tour. 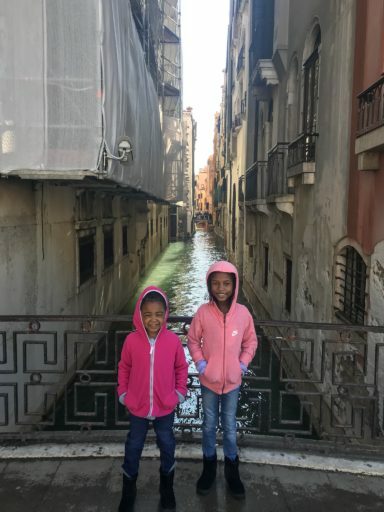 The hidden treasure tour is touted as a “must do” when visiting Venice with kids so it is worth checking out. It also discounts your admission to the clock tower! Out of pure luck, we managed to stumble upon a kids library. There’s a lot of information out there on the Interwebs about the infamous book stores in Venice but not much about the public libraries there. This one was just for kids — all the books were picture books and they even had a play space. Unfortunately, neither of us thought to actually document the name of this place. However, it is there and it is awesome! If anyone happens to find it, leave us a comment! Thank you to one of our readers for helping locate the library! It is called *drum roll please* Bettini Junior. We also stopped by the Libreria Acqua Alta book store. It literally translates to High Water Bookstore. I’ll give you 5 guesses for how it got its name :) Yes, it floods [like most of Venice]. They are so used to it that all the books are stored in bathtubs, canoes, gondolas, etc. 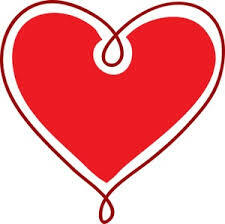 ; when the water rises they will float and [hopefully] come out undamaged. In the courtyard, the books are stacked in a makeshift staircase. 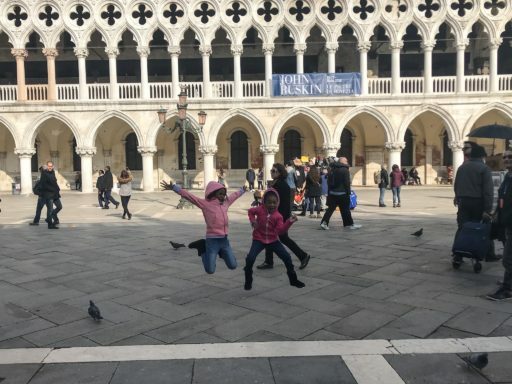 Unfortunately, we didn’t get to spend much time here but it is a must see when in Venice with kids! The rest of the day was spent eating [including a stop at Hard Rock Venezia — which was awesome], walking, and eating some more before calling it a night. 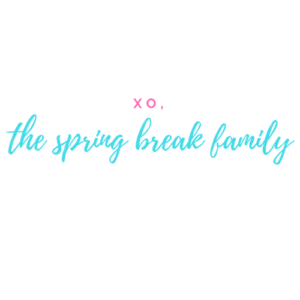 It’s no secret that we absolutely love Flytographer! 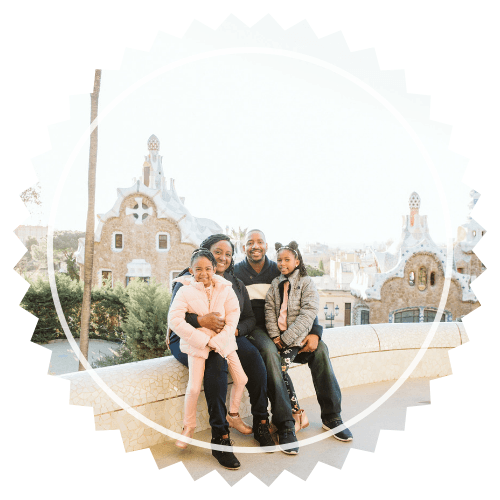 We honestly do believe that Flytographer is a must for your next trip so we make sure to book a session with them for each of our Spring Break Family Trips. 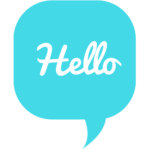 You can read more about their service and snag a $50 credit here: Flytographer review. This year we booked with Marta Buso in Venice and we loved it even more than our session with Olga in Paris the previous year! Mind you, it had been sunny and relatively warm the previous two days we were in Venice. But in a funny turn of events, a huge storm swept through the morning of our shoot. Not only was it cold but it was dreary and wet. Our clothes got soaked on the walk over, the kiddos were freezing, and my poor wig looked like a wet cat. We were determined to do the shoot but were convinced the resulting pictures wouldn’t be that great. Well, thank goodness for Marta! Her personality alone was enough to warm us up but she kept everything upbeat and perky. She also managed to get a ton of good shots in that horrid weather. Except for Phil’s shirt and Bug’s facial expressions, you can barely tell the weather was horrid that day. We ended the trip with a fantastic story to tell and a wonderful souvenir of our trip together! Plus we <3 Marta! After the Flytographer session, we packed up our stuff, headed to the train station, and caught the train to Milan. Have you been to Venice? Do you have anything to share? Feel free to leave a comment below! Wow. What an awesome experience for your family. I will be going to Venice in September. I will fly in to Milan then travel to Venice and Florence% I think I will follow most of your excursion. I’m going with a former coworker/ friend. So there are no kids. The one thing I want to do the most in Venice is to see the opera that was featured in the movie Pretty Woman (La Traviata). Your trip looked wonderful and I do plan to have a great time. Thank you sooooo much for sharing. YAY Roxanne! So happy to hear this was helpful! LA Traviata looks absolutely stunning but then again most things in Venice are! Hope you and your friend have a wonderful trip! I think the library is the biblioteca bettini junior: https://www.comune.venezia.it/content/bettini-junior — google maps seems to have the wrong place for it, but we’ll look for it if we’re in the neighborhood. Thanks for sharing your wonderful trip!